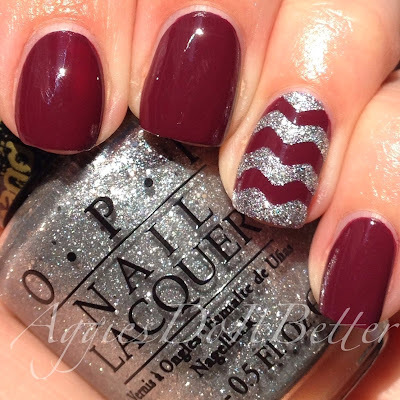 Aggies Do It Better: Zoya Toni with silver chevron accent aka AGGIE NAILS! Zoya Toni with silver chevron accent aka AGGIE NAILS! Hey guys! Happy Thursday! Today is special for 2 reasons....it is my wedding anniversary with the Mr! And also, today is the NFL draft and Johnny Manziel and nervous and Johnny Football! Gig em! Today I'm wearing maroon nails in Zoya Toni to give Johnny some good luck :) I blinged them up for the anniversary with OPI It's Frosty Outside liquid sand. I just love how it came out! This is Zoya Toni on its own. 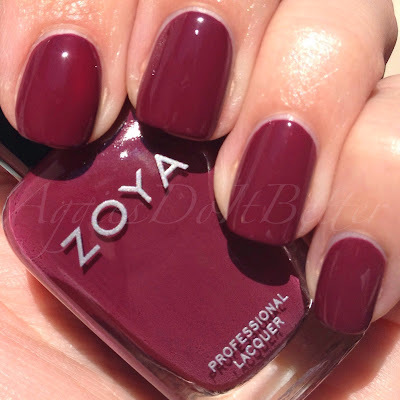 I carefully chose it from looking a lot of swatches online for the Zoya Earth Day sale! It is super opaque and really trying to be a one coater...I had a hard time getting the first coat thin enough to do 2 coats!